CHATHAM — Greg Jones (UNC Wilmington) sat back in the batter’s box with his bat resting on his left shoulder. For the league-leading 14th time this season, he would be walked. Bourne’s Kyle Martin (Fordham) was halfway to intentionally walking Jones, and the A’s were creeping closer and closer to completing an improbable comeback. 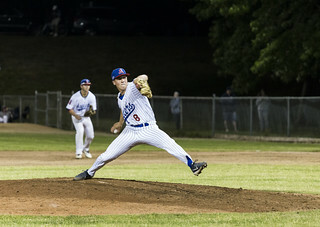 After surrendering six runs in the opening two frames, Chatham meticulously worked its way back, and, after five-plus innings, had tied the contest. The game-tying sixth run was tallied earlier in the eighth, and, with two runners in scoring position, pitching to Jones was not in Bourne’s plans. He was just two lobs away from completing the intentional walk. But the third toss never found the glove of Bourne catcher Cooper Johnson (Ole Miss). Rather, it flew to the backstop. Immediately, Brendan Fryman (Samford) reacted, dashing home to score the go-ahead run. A batter later, a sacrifice fly from Adam Fogel (Hawaii) scored Ben Ramirez (USC), adding an insurance run. The three-run eighth inning secured a Chatham (6-3-2) victory over Bourne (6-5), 8-6, marking an incredible come-from-behind effort on Friday night at Veterans Field. "Keep chipping away, keep getting runs,” Kyle McCann (Georgia Tech) said about the team’s philosophy. “Stay positive. In the end, it'll work out." The Braves made Anglers’ starter Jackson Wark’s (Saint Louis) life difficult from the outset. The visitors scattered base knocks all around Veterans Field in the first inning, tallying four in total. Spencer Brickhouse (East Carolina) and Tyler Fitzgerald (Louisville) each drove in runs with back-to-back singles, putting the A’s in a two-run hole before their first at-bat. Wark threw just four pitches in the second inning — all balls — before being replaced by recently activated Zach King (Vanderbilt). But things didn’t get any better for the home team. King retired his first two batters before Jared Triolo (Houston) drilled a single to center field to keep the inning alive. Spencer Horwitz (Radford), the next batter, opened the floodgates. The Bourne three-hitter sent a King fastball beyond a gazing John Rave (Illinois State) and the center field wall, extending the visitor’s lead to five. Brickhouse followed Horwitz’s long ball with one of his own, a near-identical shot to the right of the flagpole in center field. The A’s mustered their first baserunner in the bottom of the second, when Drew Mendoza (Florida State) drew a walk, then stole second on an Austin Pope (Fairfield) wild pitch. Two batters later, McCann floated an RBI single to right field, the first base knock Pope allowed in 5.2 innings this summer, to put Chatham on the board. In the fourth, Mendoza was again the catalyst. After Rave singled and Torkelson walked, Mendoza blooped a broken-bat single to right field, scoring Rave and reducing the deficit to four. Two pitches later, it narrowed to three, as Tristin English (Georgia Tech) scored Torkelson on a sacrifice fly. As Dan Hammer (Pittsburgh), who relieved King to start the fourth, quieted Bourne’s offense, the A’s continued to mount their comeback. A Jorge Arenas (Stetson) walk and Greg Jones (UNC Wilmington) put two runners on base for Torkelson in the sixth, who delivered. Torkelson dropped the ball in the left-center field gap. The base knock scored Arenas and Jones, bringing the Anglers within one, causing a mundane Veterans Field to come alive with excitement. Chatham narrowly missed out on tying the game in the seventh, as Mendoza popped out to left with runners on the corners to end the inning. After scoring six runs in the first two innings, the scoreboard read zeros from the third inning on for the Braves. Hammer and Greg Veliz (Miami) were brilliant in relief, allowing four hits and no runs. “I just try to go in there and throw as many strikes as I can to get us back in the game,” Hammer said. “And that happened tonight."